meri has made progress on the Craftvent 2016 Advent knitting calendar she received as a gift earlier this month. … Ok. There’s more to this than I realized. But! Definite progress has been made, and the end is in sight. It looks like the sweater is going to be pretty long, particularly given the intended recipient. Luckily, this shouldn’t be a problem, as that style is a favorite of hers. One of the projects I’m doing is fairly small, in terms of “actual finished product.” However, it is knit on US 2 needles, which are pretty tiny, so it’s a very fine fabric that’s being produced. It’s also a very intricate pattern, which means a lot of switching back and forth between staring at the yarn and staring at the pattern. But, thus far, it’s been zipping along pretty quickly. 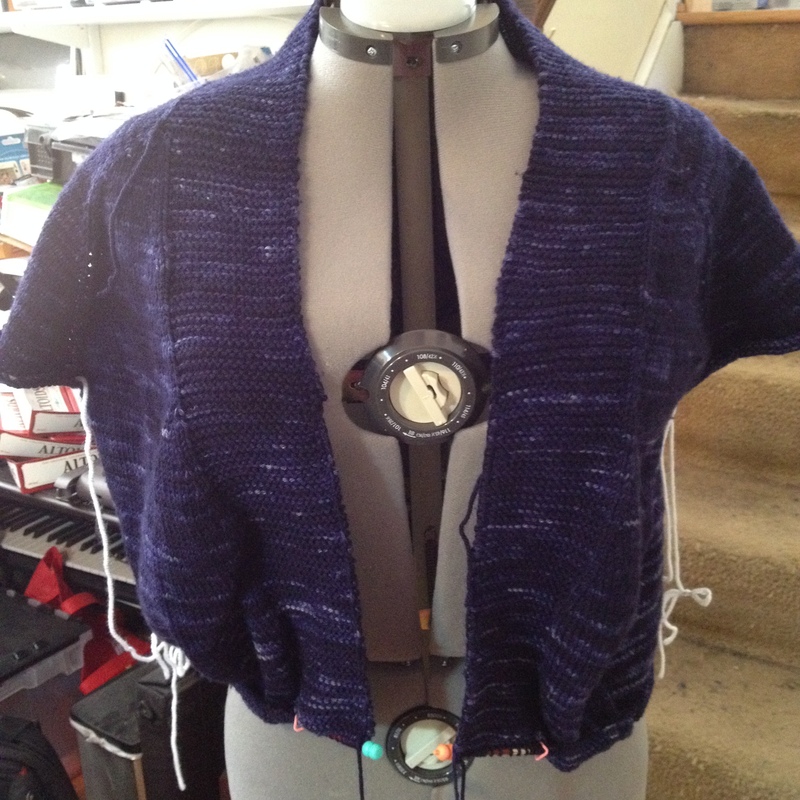 I’ve gotten about a third of the way through the physical project in about 3 days of knitting. This lulled me into a sense of complacency, thinking that I’d be able to tear through the rest of the project equally quickly. Little did I know that the “intricate” work that I’d been working on thus far was really easy, and the intricacy had not yet begun. I noticed that there seemed to be a decent number of cables in the part I was working, and looking ahead to the pattern, there were many more. In a fit of madness, I thought I’d count up just how many more. 470. 470 cables total in the project. Of which I have done about 30. I’m not quite sure how it happened. Sure, I usually have a couple of projects going at any given time, but right now, I’m completely awash in projects. They range in intricacy from “completely mind-numbingly boring” to “gods help the person who talks to me while I’m working on this.” It’s kind of nice to have a variety of things to work on, but a couple are on deadline, so there’s that added looming sensation. Shamala’s socks, which needs Shamala’s foot in order to continue. I have yet to convince her to mail me a foot. 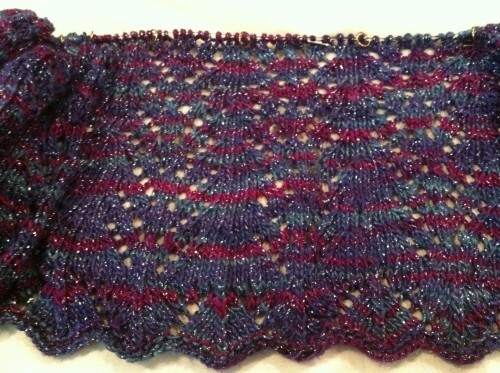 A pretty pretty shawl. No intended recipient yet. A super secret scarf project. A super secret toddler project. Tech knitting a shawl for a local designer. These are just the active projects. I have another dozen or so sitting in hibernation. And we’re not going to talk about the blocking (much of which also has deadlines). Oy. 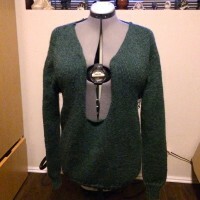 Tinking is the process of un-knitting (tink = knit backwards). This is something that is done when one has made one (or more) mistakes. Sometimes, you catch your mistake pretty quickly, and you only need to tink a few stitches. Other times, you don’t catch the mistake until you’ve made a decent amount of progress. When that happens, you have a few choices: 1) tink back to the mistake; 2) pull your needles out and carefully rip back your stitches to the mistake, and then re-insert the needles; or, 3) throw your project across the room and find a good stiff drink. Today is looking to be remarkably unpleasant, meteorologically speaking. I hope everyone manages to stay cool, or – at the very least – hydrated. My plans for the day include geeking (which OSX keeps trying to correct to “geeing”), cleaning, knitting (probably finishing one of the SSMS™s) and perhaps lunch with G. There are definitely worse ways to spend a day. Best of luck with whatever adventures you may meet today! Whoo! As predicted, the fourth installment of the SSMS™ showed up on Tuesday. You may recall that I have started three different iterations of this shawl, and have discarded one, because the yarn and I were not getting along with one another. So, the black and white Kauni is SSMS™ #2, and the new blue / purple Blue Heron is SSMS™ #3. When the fourth installment of the pattern showed up, I was working on #3, so I kept working on through. The photo below represents a couple of pattern repeats of the work in progress. It’s coming along nicely, I think. As for SSMS #2, I’ve alluded to the fact that I’d made some mistakes and corrected them. I was, however, only half right. I did, in fact, make mistakes. I did not correct them. So, last night I completely ripped it out and started over. I’m about 90% of the way through Part B right now, and should be fully caught up long before the next (and final) installment of the pattern shows up.